As this blog has discussed, corona and plasma surface treatments are a common way for industrial users to prepare low surface-energy substrates for bonding. While much time can be devoted to covering the differences between the two, the question that always remains at the end is "How effective was it?" Before an adhesive can be applied, users need to be sure that surfaces have been properly treated to allow for maximum wettability. Wettability, a concept integral to why surface treatments are needed in the first place, continues to be important in determining the effectiveness of corona or plasma processes. Here's some more information on why testing the quality of surface treatments is important and what some common techniques used to test are. The fundamental purpose behind surface testing for adhesion is the fact that it's impossible to tell with the human eye if a substrate is properly treated. That's not to say surface treatments are unreliable. Corona and plasma surface treatments are widely used because they are usually successful, but users can't assume a treatment will work because of the variables inherent in the treatment process. Corona and plasma treatments can be repeatable to a point, but different materials react to treatment in different ways. Factors like energy supplied to the machine, process settings, topography compatibility, material temperature and age, and size of the surface to be treated may all play a role in how the treatment is actually conducted. Considerations also extend to the materials undergoing treatment. For instance, plastic films are generally nonporous substrates with low surface energies that are engineered chemically inert and with limited bonding sites, according to Paper, Film and Foil Converter. All of these characteristics may interfere with surface treatment - in this case, plasma - and users can't risk applying adhesive or coating only to see droplets form and poor wettability ensue. 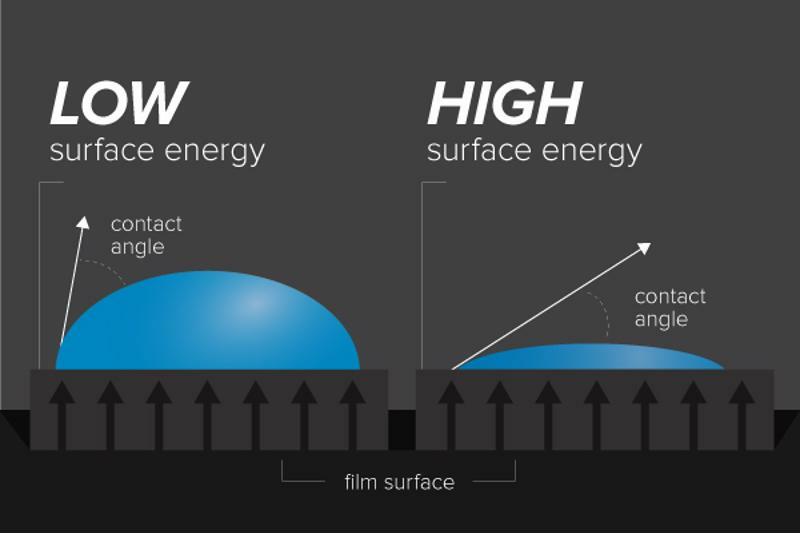 Surface energy is an important consideration in application. Dynes are a unit of measurement that can quantify surface energy and which can be calculated before and after treatment. Doing so will help users optimize conditions for treatment, as well as establish a baseline to measure against after treatment. In many cases, paper, film and other material suppliers will include information on dyne levels of untreated surfaces and to what desired dyne levels users should raise surface energies for proper adhesion. A primary way for measuring dynes is by using dyne pens and other testing kits with solutions applied to the treated substrate. Dyne pens resemble oversized markers, and that's essentially what they are: Pens are wiped across substrates and if the colored solution wets across the surface in an unbroken line, desired dyne levels are reached; if, however, the solution beads up, dyne level is off. These pens are usually available in increments of +/- 2 (pens calibrated to 46 dynes, 48 dynes, 50 dynes, etc…) and users should be knowledgeable on the ASTM D2578-04a standard that provides guidelines for wettability tension testing of film. One thing to keep in mind is that dyne pens, while an easy and quick testing method, can be subjective (one person may see 34 dynes while another sees 36) and levels that are in between pen increments may be hard to judge. There is also the risk of pen tip contamination, which could alter readings. Dyne pens are best leveraged to quantify effectiveness on a pass-fail basis, rather than being used to make specific readings. If users need more specificity in results, there are other methods of testing. "Contact angles can also help determine effectiveness of surface treatment." The contact angle of a test liquid droplet can be used to interpret the success of wettability. Measured as the angle produced by the intersecting lines of the horizontal substrate and the tangent of a drop, angles approaching zero indicate proper wetting (the more spread out a drop, the lower the angle; the more beaded up, the higher the angle). Contact angles can also help determine effectiveness of surface treatment. The process for measuring them, however, is more intensive than using dyne pens. This is because machinery is needed to accurately test and measure contact angles, which restricts the method to settings (like laboratories, rather than factory floors) that can house the equipment and provide a clean environment for testing to take place in. The meters used to measure contact angles resemble microscopes in part; they work by capturing the shape of parallel, separate drops and measuring differences between them to test for contact angle and surface tension, as well as free energy. Another method for testing that produces more accurate results than dyne pens - but which acts in a similar way - is the draw-down technique. This test used laboratory metering rods to drag droplets down across a substrate sample affixed in vertical position. Single droplets of varying levels of dyne solutions are placed at the top, and then the metering rod applies pressure and pulls the droplets down. If the line of one droplet is broken (like it may be with a pen drag), the user will know dyne level has not yet been reached for successful wetting. Users encounter the same challenges with testing methods for treatments as they do with corona and plasma options themselves. Mainly, the variety of testing options, settings, uses, applications and materials make the choice of testing method a hard one. However, users should keep in mind the scale of their project and whether they have the means to pursue methods like contact angle. Consulting with an adhesives partner may help clear up the situation and arrive at a right-sized solution.